If it's your first time learning to drive with Book Learn Pass in Dagenham, you can take advantage of our great introductory offer. 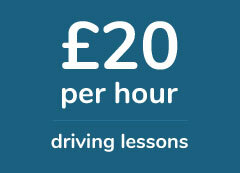 Book 10 driving lessons or more and pay just £22 per hour, saving you £30 of the standard fee. We pride ourselves on offering driving lessons which are affordable, fun and great value for money. If you are a current student learning to drive with Book Learn Pass, we have some of the most competitive prices in Dagenham. Prices for current students start at £25 per hour. If you are looking for driving lessons in Dagenham, why not learn to drive with one of our fun friendly and professional driving instructors in the Dagenham area. Our driving lessons in Dagenham are personal, alwaays delivered one on one and great value for money. We have helped hundreds of learner drivers in the area pass their driving test and we are a respected driving school in Dagenham. Our driving instructors in Dagenham are all approved by the DVSA and very experienced. Using our tried and test teaching techniques, we can help you learn to drive in just a few weeks. We will teach you test survival skills and best practice for passing at your chosen test centre. You can book cheap driving lessons in Dagenham with Book Learn Pass today. Simply fill in the contact form and we can have your first driving lessons scheduled in minutes. If you need your driving license in a short period of time, why not try one of our intensive driving courses in Dagenham. These course run for a shorter period of time, typically 1- 2 weeks depending on your availability. Our crash driving courses in Dagenham will have you at test standard and ready to take your driving test in no time at all. You can also learn to drive with a female driving instructor in the Dagenham area too. We have a number of female driving instructors who cover Barking, Dagenham, Hornchurch and Romford. We teach both experienced learner and first time learner drivers too. About DagenhamDagenham is area in the London borough of Barking and Dagenham. It is located in East London and it borders the boroughs of Newham, Redbridge and Havering. There are an estimated 206,500 residents in the borough. This includes 56,000 children – 27% of the population – (those aged 0 – 15), 130,100 people of working age – 63% of the population – (those aged between 16 – 64) and 19,800 people of retirement age – 10% of the population. Barking Abbey: Barking Abbey was a monastery founded in the 7th century, in approximately AD666. It had an illustrious history and was once regarded as one of the most important monasteries in the country. It regular housed members of the Royal family, including Queens and princesses. It’s ruins form part of Abbey Green and it’s one of the best attractions in Dagenham. Dagenham Market: Dagenham market is one of oldest markets in East London. It has been running since 2002 and is open on Sundays from 9am to 3:30pm. Well loved in the local community, there’s plenty to do in Dagenham market and once you have your driving license, it’s a great place to come and visit. For more information please visit the official website and its twitter page. Valence House Museum:The former timber house is one of Dagenham’s best kept secrets. It’s located in Valence Park and now houses local artifacts relevant to the Barking and Dagenham area. A favourite of locals it’s certainly an attraction you should visit at least once and it’s a perfect venue for a spot of relaxing once you have passed your driving test. For more information on what it’s like to live in Dagenham and places to visit in the town, this reddit thread discusses all things Barking and Dagenham. For the full list of council run car parks, click here. Cars for Sale in DagenhamIf after passing your driving test you are ready to buy your first car, there are a few things you need to consider before doing so. Things such as should you buy new or used, how much you should spend and what type of insurance you should opt for are all important. Once you are ready to purchase a car, this handy guide can help with all the things you need to think about. If you are looking for cars on sale in Dagenham, there are several websites which list cars for sale in the local area. To help you get started, we have listed a few websites with used cars for sale in Barking and Dagenham. Minicab and Taxis in DagenhamAnother great way to see Dagenham if you are yet to pass your driving test, is to travel by minicab or taxi. The cost of doing so is relatively cheap and with a number of tazi firms in Dagenham, it’s another great way to see the town. There are a number of minicab firms in the area and we have a listed a few below to help you get started.